If you’re a Heroes of the Storm fan, then you have likely already seen the headlines from around the net showcasing the new progression system that Blizzard is introducing into it’s MOBA title. 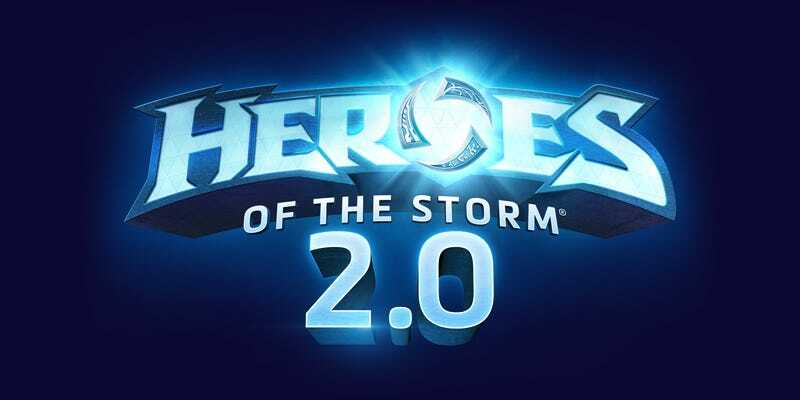 Heroes 2.0 is more than just a progression. This is Blizzard’s attempt at expanding it’s reach and trying to pull in new players, and retain a lot of the veterans. This is the gaming giant clawing its way into the often chaotic world of MOBA eSports. You can check out all of the recent announcements here. Yes, of course the highlight is the progression system. They’ve evened out the experience requirements, by increasing the requirements for lower levels and decreasing significantly for higher ones. They’ve also removed the player level cap altogether. This makes it more enjoyable to play a favourite Hero, while still a challenge to experience a new one. The introduction of the loot box will likely cause a bit of a stir, but it’s proven extremely popular in Overwatch. If it ain’t broke, why fix it, right? This is the best model to make the game 100% free to play. Before, many of the alternative skins were locked behind a paywall. Sure, it wasn’t pay-to-win, but there was a lot of content that only real dollars could buy. Now, Blizzard has changed the game into a COMPLETELY free-to-play model. Sure, you can buy the loot with cold-hard cash, but now you can grind them out in game (leveling rewards, events, etc.). They’ve also added a lot of new features/cosmetics to unlock through the loot boxes, too. No longer are the only additional items just skins and mounts. They’ve opened customization up completely by adding voice lines, spray tags, emojis, skins, colour variations, and more to the loot system. They’ve also taken note from some rival MOBAs by adding new customizations like announcer voices, banners, and portraits. Another thing that I’ve taken note of (although not specific to the game) is Blizzard’s new transparency to their immediate release schedule. Gone are the days when they would announce a new Hero/battleground a week before it hits their Public Test Realm. For the next month, Blizzard has outlined all of their PR events, new challenges in the game, new Heroes, etc. This, in my opinion, all ties into Blizzard aggressively pushing Heroes of the Storm into the eSports world. Right now, League of Legends and DOTA 2 dominate the professional MOBA scene. Blizzard recently started the Heroes Global Championship to stir up interest and get a pro circuit started. Now they just need their numbers up, and they are attempting to do that with Heroes 2.0 by making it more appealing to new and veteran players (the overhauled progression system), while pulling in popular features seen in other Blizzard (loot boxes/tags/voice lines from Overwatch) and some competing games (banners/announcers/portraits). So far they’ve handled the start to their pro scene very well, and this seems like a push in the right direction to build a larger audience and gamer pool. If you’re a Heroes fan like me, then a lot of this is great news. If you don’t know anything about Heroes, then everything you just read probably meant very little to you and I suggest you try the game out!